W. A. Dwiggins described a recipe for an idea; involving a mix of coffee, cocktails and jumping up and down for a few days until the concept digests in your brain and manifests on paper. So what is the recipe for a designer? Curiosity and passion are what drives our communities best and brightest. When you add perseverance to that mix, you get a very special breed of creative. Book designer (and photographer) Bruce Kennett is at the centre of this kind of Venn diagram. Bruce discovered Dwiggins work in 1972 after befriending Dorothy Abbe (Dwiggins Assistant) and spending time in their studio. Being inspired by WAD and his ideas for decades, Bruce spent the last 14 years researching, writing, curating and designing his soon to be published book 'W. 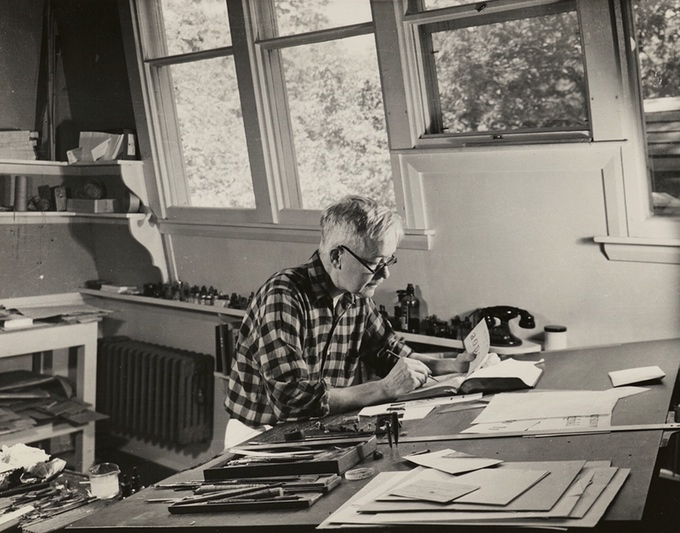 A. Dwiggins: A Life in Design'. The first comprehensive biography of one of the most innovative designers of the 20th century. In the book, Bruce Kennett's, careful research is scaffolded with Foreword by Steven Heller, alongside contributions and interviews with people who knew WAD personally. W. A. Dwiggins: A Life in Design will be 480 pages, 9 x 11 inches, printed in full colour throughout, 88,000 words of text with end notes and index, 1200 illustrations (of these, over 200 reproduced at actual size), Smyth sewn, case bound with full-color endpapers. Available in both Standard Edition Bound with full-color photographic covers and satin Mylar protective lamination. And a Deluxe Edition Book (with letterpress portfolio), housed together in a slipcase. The deluxe book will have Dwiggins-designed decorated paper over boards and a genuine leather spine. The portfolio will present a collection of Dwiggins’s essays and fiction, set hot-metal in types of his design and printed letterpress. Dwiggins understanding of the subtleties of calligraphic form and stroke sequence (he trained under Frederic W. Goudy. ) made his designs radically different to those created by his contemporaries. The Falcon typeface was perhaps the most experimental type project of his career. 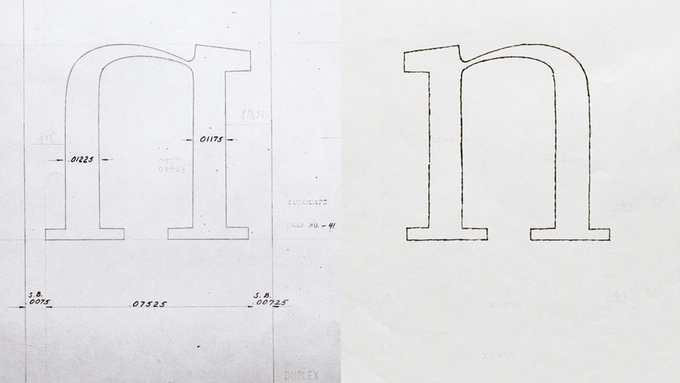 To create Falcon Dwiggins used a series of stencils in a ‘mechanical process’ to template the curves, counters, crossbars and stems to ‘hit the middle ground between mechanical exactitude and the flow and variety of the written hand’. Electra (1935) was WAD's original book typeface, designed to reflect the modern machine age, 'be electric with sparks and flicks of metal flying free', Electra was prolifically used in book and editorial setting, during the hot-metal era it is a robust and readable typeface. Master letterer and type designer Jim Parkinson has designed a digital revival of Electra for the book. It is a sensitive translation; the sturdy yet elegant shapes, readability, and vigour of the metal original are all reborn in bezier curves. My first encounter with Dwiggins was in 2002 (while working on a dissertation for my bachelor of art and design at AUT). I read a paper published by Vincent Connare called the 'The Type Designs of William Addison Dwiggins', which lead me from WAD's type (he designed 36 fonts), to his elegant book design work, (a valuable source of inspiration throughout my professional career), and on to his modular approach to creating decorative and ornamental shape (is a concept I play with most weekends in the print pavilion). I have long been fascinated with his experimental letterform construction methods, the elegant page proportion, dynamic layouts and abstract shape grammar in his work. I was waiting to send this month's Newsletter until after the project launched on Kickstarter to help spread word of the book - but it seems everyone in the community is as incredibly excited as I am about this publication as it reached full funding after just one day! (A testament not only to Dwiggins significance but also to Bruce Kennett's hard work) there are 28 days left for you to secure your copy of the book (or the typeface - or any number of the delightful Dwiggins backer rewards!) through the Kickstarter platform. It is particularly important to note "in 1932, Dwiggins and George Macy (head of Limited Editions Club, responsible for distribution) sent out a prospectus for Towards a Reform of the Paper Currency, announcing that the edition size would be set by the number of orders received by a certain date. In the end, they printed 452 copies." As a nod to Dwiggins approach, Letterform Archive and Bruce have decided to do the same with the deluxe edition of the biography, only producing as many copies as have been ordered (via Kickstarter, prospectus, and visits to the Archive) by 28 April. So act quickly! Newer:Preserving One Of Europe’s Oldest Languages Through TypeOlder:Can the legal system be more understandable for non-lawyers? Can legal documents be more legible?